The Board of Supervisors is the governing body of Washington Township. Board members are elected officials and are elected to staggered six (6) year terms. Board members combine legislative and executive roles as they both enact the township ordinances and are responsible for the administration of the township government. The supervisors derive their authority from the Pennsylvania Second Class Township Code available for reference on-line. Regular Supervisor Meetings are held on the first and third Mondays of the month (except when a holiday falls on a Monday – that meeting would normally be held the following Wednesday evening). Supervisor Workshop Meetings are held the Wednesdays prior to the normal Monday meetings. All Township Meetings are open to the public and begin at 7:00 p.m. in the Washington Township Municipal Building Meeting room located at 13013 Welty Road, Waynesboro, Pennsylvania, 17268. 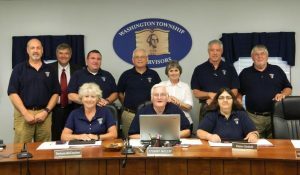 If you have business to be placed on the Washington Township Supervisors meeting agendas, you may contact the township staff at the Township Municipal Office, Monday through Friday, 8:00 a.m. to 4:30 p.m. at 717-762-3128. All submitted agenda items must be at the township office no later than 4:00 p.m. on the Friday before the regular business meeting and no later than 4:00 p.m. the Tuesday before the workshop meeting. Regular business and workshops are both official supervisor meetings. Workshops differ in that they are mostly devoted to in-depth presentations and relevant material review while regular business meetings pay invoices, award bids for both township purchases and sales and approve submitted zoning and subdivision applications. All supervisor meetings start with a Pledge of Allegiance to the United States Flag followed by an open forum for citizen comments from the floor.